In the coming months, the days will be longer and the sun will feel brighter. Great weather means lots of events. From weddings and company picnics, to graduation and bridal showers, the list of spring and summer plans is extensive. Finding a new look for every weekend due to these events can become tiresome (and pricey), so we’ve gathered a few looks that will get you through this busy season in style and without breaking the bank! Sometimes it’s hard to hunt down a dress that looks fabulous on you and won’t upstage the bride’s ensemble (no wearing white ladies). 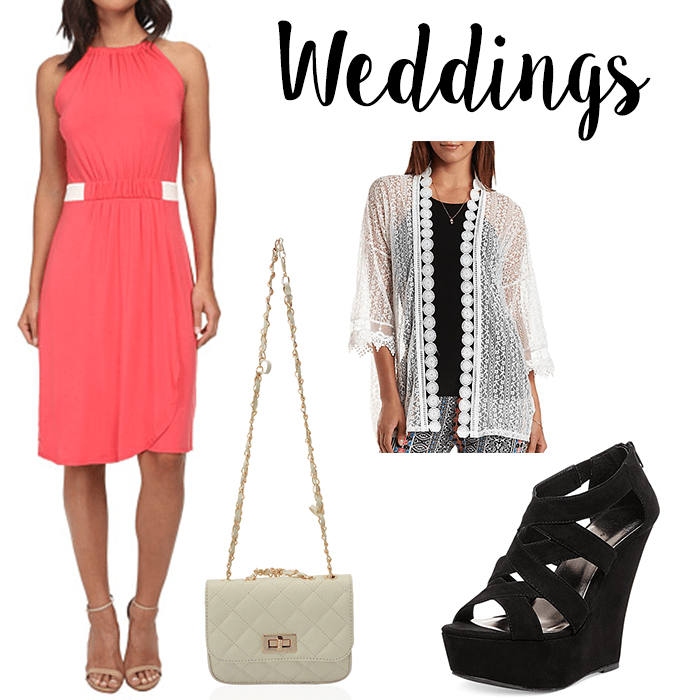 Strolling in, wearing a colorful A-line dress will make you the ideal wedding guest. This season calls for pretty pinks and bright yellows, so this dress from Zappos featuring a gorgeous coral hue is perfect. It’s not too showy, yet people definitely won’t mistake you as the mother of the bride. As far as footwear, wedges are perfect because they elongate your legs without the soreness that you get from wearing a pair of pumps. This shoulder bag is small enough for convenience, yet it has enough room for wedding favors (or maybe even the bouquet after the bride tosses hers!). If you have a graduating senior in your life, chances are you’ll be headed to a campus fairly soon. Whether you’re a proud parent, sibling or family friend, dress up for the occasion by wearing a stylish, smart ensemble. This stunning white dress features a shirt-dress silhouette (now we see why this style is trending!). Add a pop of color with emerald earrings, which happens to be the birthstone for May. Of course we can’t forget these stylish, yet comfortable wedges and chic handbag. Spring and summer are seasons full of outdoorsy events including company picnics, family reunions, music festivals and more. The key to finding an outfit in these situations is to dress prepared. This cutout romper featuring a floral print is versatile enough for several settings. If the weather is colder than expected, this trendy kimono cardigan will keep you stylishly warm. As far as footwear goes, the knee-high gladiator sandal is a hot item and we can see why! It’s comfortable for any event that requires extensive walking, yet stylish enough to wear around coworkers and peers. Complete your look with a statement piece like this long-finger ring. Its unique construction features white Austrian crystal in silvertone. It’s wedding season, which means it’s also bridal shower season sprinkled with a few baby showers. Look stylish while you’re showering your best friend or family member with gifts. With pleating on the skirt and on-seam pockets, this floral print dress makes the perfect addition to your spring closet. Pair it with the wedges we keep raving about and the cream shoulder bag. Lastly, this glass pearl necklace with Austrian crystal features a twist to the classic pearl necklace and complements the dress effortlessly. With these outfit ideas, we’re sure you’ll be prepared for any event that your friends and family will throw at you this season. No need to spend a fortune every weekend on a new look because you can mix and match these items in a number of ways! 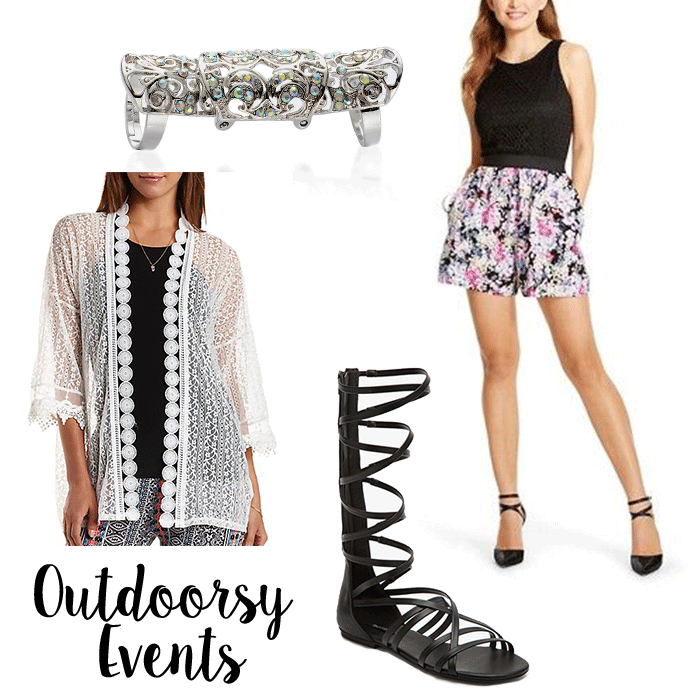 Do you have any plans for this season that involve a stylish ensemble? Next post What Colors Look Best On Me?